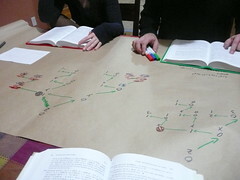 Every week, we get together, and study from Knuth. Large sheets of paper and colored markers help a lot. Whose hands are those? And do I see 3 books.. you have found a third person locally? Just remember - pointing a gun at those links'll get 'em to dance!